Here are the details on their new docks…. Designed to work with most iPod models, the ICF-C1iP clock radio accommodates standard iPod adapters, but does not require their use. An adjustable backstop mechanism ensures that the iPod fits snugly and securely to the clock radio’s 30-pin connector. An included wireless remote control provides full access to the iPod’s menu, as well as to radio tuning and volume functions. Additionally, the unit charges the iPod while it’s docked. 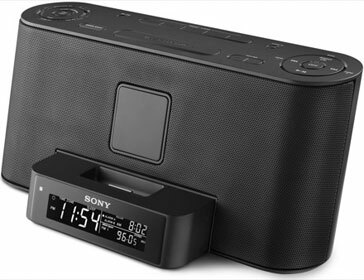 Sporting a full-function alarm clock, users can wake up or fall asleep to content on their iPod, the radio or a buzzer. When first powered on, the clock will automatically display Eastern Standard Time, which easily can be changed to other time zones as appropriate. The unit also has automatic Daylight Savings Time adjustment, eliminating the need to reset the clock in the spring and the fall. Adjustable brightness control over the LCD display provides easy readability. It’s also easy to take your music with you this summer with Sony’s newest boombox. Just like the clock radio, it works with most iPod models and charges the iPod when docked. 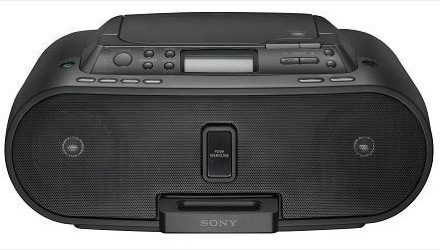 It includes a built-in digital AM/FM tuner, an integrated CD player that supports CD-R/RW playback and a wireless remote control with full iPod menu access. The dock tray is retractable when not in use. The boombox also has an auxiliary input and supports AC/DC operation (batteries not included). For more sound impact, it incorporates Sony’s Mega Bass Sound system. The clock radio and boombox come in both black and white designs. They will be available in August for about $100.